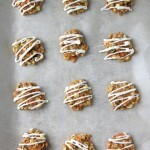 These Carrot Cake Cookies with Cream Cheese Drizzle are an oat drop cookie with shredded carrots, cinnamon, raisins and white chocolate chips. They’re moist, spicy and a real treat with the addition of the cream cheese drizzle. They’re perfect for Easter. In a mixer, cream together the butter and sugars. Stir in the shredded carrot and milk. In a separate bowl, whisk together the flour, oats, baking powder, salt and cinnamon. Drop the cookie batter by the tablespoon onto a parchment paper lined cookie sheet. Let cool then drizzle with the cream cheese drizzle. Cream together the cream cheese, icing sugar and cream, until smooth. To drizzle the icing, I like to put the icing into a ziplock bag, cut off a tiny corner of the bag, and pipe on the icing.